Seven Fish is the restaurant you’d love to call your own. Joining two old town streets, it is Key West’s hometown bistro, its own corner eatery. This one is different from most in that the comfort food includes fresh, local fish. Call it a fish-style bistro, where mahi-mahi and sashimi mingle with meatloaf and steak. Seven Fish is walking distance from Duval Street, but doesn’t feel like a tourist town eatery. It is a smoke-free, tastefully accessorized space. 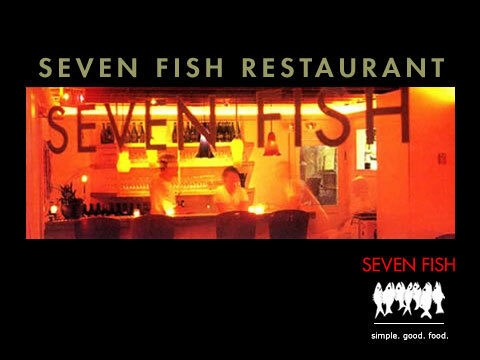 Don’t miss a night at Seven Fish next time you visit Key West. Our offbeat location, cozy environment and satisfying food will make you think you’ve found yourself a new hometown. Reservations are recommended. SEVEN FISH WINS HIGHEST ZAGAT SCORE IN THE FLORIDA KEYS. As you saunter down a Key West street "off the beaten path", "keep your eyes peeled" or "you may miss" the place with the "hands-down best" Food score in the Keys Survey; a "tiny", "upscale" "neighborhood bistro of the kind not usually found" in town, this "quirky" Eclectic "with a SoBe feel" puts out everything from meatloaf and mash to an "interesting" Thai curry yellowtail snapper, and whatever you order, it's "incredible every time." T & L, "READERS FIND" SECTION, NOVEBER 2001. Several blocks from Duval Street's crowded restaurants, where frozen drinks are served to the music of Jimmy Buffett wannables, is Seven Fish (632 Olivia St.; 305.296.2777; dinner for two $50). This small restaurant specializes in local, freshly caught seafood, Award winning yellowtail snapper, grouper, and dolphin (mahi-mahi, not Flipper!) are prepared in a variety of Asian-fusion ways. We've gone annually for the past three years and have never been disappointed. It's worth the walk! W MAGAZINE'S LARGE FEATURE ON KEY WEST FROM FEBRUARY 2000. "...the group is headed to Seven Fish, a tiny restaurant on Olivia Street with a minimalist decor that looks more East Village than Key West, but the food has a definite tropical flair, with banana chicken and shrimp salsa with chili-lime chips..."
COUNTRY LIVING, SEPTEMBER 1999. "Don't go looking for Key West's best bistro anywhere near tumultuous, tourist-mad Duval Street. Check over by the cemetary and you'll find Seven Fish, a tiny 40-seat restaurant nestled on a quiet, moonlit street in historic Old Town. Locals love the out-of-the-way location and beat a path there, finding a seat at one of the tables set beneath the hipped-roof rafters or at the aluminum diamond-plate bar"
The New York Times, 2000. "Housed in a blink-and-you'll-miss-it former luncheonette, Seven Fish has a chic interior with a number of small square tables and metal-topped bar. The food was delicious—we started with a seriously good roasted red pepper and goat cheese salad, and then moved on to the fresh fish that is the restaurant's claim to fame. Stuart had grilled mahi-mahi with dried peppercorn sauce over roasted red potatos, and I had yellowtail snapper sautéed in a Thai-curry cream sauce."